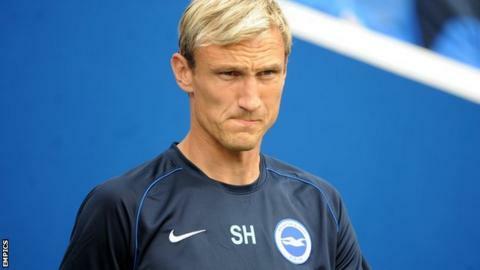 Sami Hyypia has resigned as manager of Championship strugglers Brighton & Hove Albion after six months in charge. The Seagulls, who drew 1-1 at Wolves on Saturday, are in the relegation zone after one win in 18 league games. Former Liverpool and Finland defender Hyypia, 41, was appointed in June on a three-year deal, but won just six out of 26 games in charge. "Sami offered his resignation, and we reluctantly accepted earlier today," chairman Tony Bloom said. Assistant boss Nathan Jones is expected to be named as caretaker-manager. "There were encouraging signs last Saturday at Wolves, but I think the timing may be down to the next game being at the Amex. The defeat at home to Millwall led to fierce vitriol from some fans. "Hyypia's tactics could have been questioned at times, but he was only part of the recruitment process and key players from the promotion push last season were simply not replaced adequately." "Sami is an incredibly honourable man," Bloom added. "He remains a hugely respected and very popular figure at our club. He has decided to step down for the benefit of the team and the club. We are all very disappointed, but we respect Sami's decision and we all wish him well for the future." Brighton have finished in the Championship play-off places in the last two seasons and former Bayer Leverkusen boss Hyypia has chosen to leave his role with Albion 22nd in the table, despite him having the backing of his players. After drawing at Wolves with 10 men, on-loan striker Darren Bent told BBC Sussex that Hyypia had the full support of the squad, while earlier in the month left-back Adam Chicksen backed the Finn. "We obviously believe in the manager and the way he wants to play," Chicksen, 23, told BBC Sussex. A section of Albion supporters had displayed a banner calling for the manager to be sacked during December's 1-0 home defeat by Millwall, after which Brighton captain Gordon Greer said the squad had "let down" Hyypia. Hyypia himself thanked the Brighton fans their support, admitting results had not been good enough during his time at the club. "It's been frustrating for us all, and me more than anyone, but I think the support I have had from the Brighton fans has been tremendous," Hyypia told the club website. "I am just very sorry I haven't been able to give them the results I hoped I could. "I said recently the fans are the soul of any club, and that has never been more obvious than here at Brighton & Hove Albion. The fans have played a massive part in making the club what it is today."